CIM Winter 2019 Issue, Spotlight article - Design Thinking: The New Mindset for CI? The article below appeared in the most recent issue of Competitive Intelligence Magazine. If you have yet to check out our Winter 2019 Issue, we highly suggest you take the time to read it. Here is the opening of the article. Design Thinking: The New Mindset for CI? Assuming we are both right, the question would be how can we make Competitive Intelligence Professionals (CIPs) think like designers, and what would Competitive Intelligence (CI) as a discipline gain from this? As a Designer Thinker, the CIP would master the heuristic technique any approach to problem solving, learning, or discovery that employs a practical method not guaranteed to be optimal or perfect, but sufficient for the immediate goals. Most of the time, due to time, budget concerns, or even the missing data points or information, the optimal solution is impossible or impractical. And this is where the use of heuristic methods can speed up the process of finding a satisfactory solution for CI purposes. Heuristics can be mental shortcuts that ease the cognitive load of decision-making. Examples of this method include using a rule of thumb, ad educated guess, an intuitive judgment, stereotyping, profiling, or plain common sense. The time for long, detailed, optimal and 100%-wrong-by-the-time-we-finish-it analysis is over. The time for faster, enough-to-make-relevant-and-value-added-decisions intelligence is up. SCIP members Click here to read the remainder of the article. Not a SCIP member, review this article and more selected for you here. 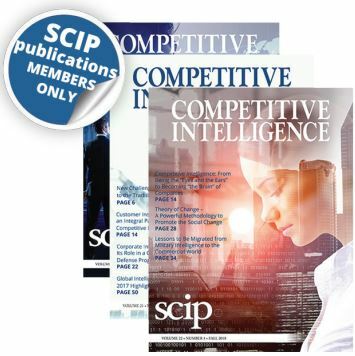 Want to see your articles published in SCIP Publications? Here's how. Don't forget to register by February 15, 2019, to benefit from our early bird registration fee.